January 18th, 2018 – New worldwide data from Vinexpo for 2016 reveals the US – at nearly $34bn total value in still & sparkling wines – remains firm leader in global value. The report forecasts that the US wine market will increase its global lead over the next five years. By 2021 US sales of still and sparkling wines are expected to reach just over $45bn in a global market expected to reach 2.66bn cases worth over $224bn. What is more, the USA is expected to lead world wine volume growth in 2017 for the 23rd consecutive year when final outcomes are revealed later this year. The data, compiled for Vinexpo by IWSR, is considered among the most reliable of all market data for the wine and spirits sectors. By contrast, the wine markets of Europe’s heavyweights – France, Germany and Italy – declined in value and volume in 2016, continuing a long-running trend. Consumption is forecast to continue to grow to 2021, at a CAGR (Compound annual growth rate) of 1%. Both local and imported wines will grow. New Zealand will be the standout performer in terms of imports to the US, with French wines also performing strongly. 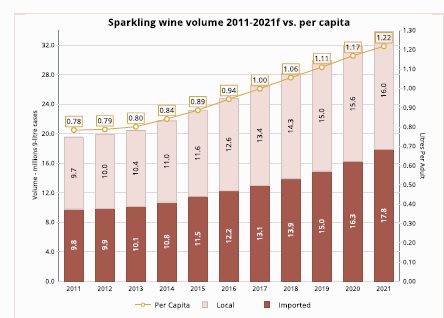 Sparkling wine is forecast to grow by on average 2% year-on-year to 2021, driven predominantly by North America. In Europe, the world’s largest regional consumer of sparkling wines, the outlook is also generally positive. Even though the UK (the world’s largest sparkling wine importer) is expected to develop strongly, it is will nonetheless be supplanted by the US as the world’s most important export destination by 2021. Prosecco is expected to grow most in the US, and in so doing the US is forecast to become the category’s second largest export destination, behind the UK. In the world of spirits, premium price points are generally performing better than value, with mainstream standard brands developing at a healthy rate. From a small base, premium spirits are forecast to increase on average over 5% per year between 2016 and 2021, while ‘super-premium+plus’ categories are forecast to outstrip premium spirits, growing on average over 7%. Scotch, US whiskey and gin are expected to grow as the global spirits market diversifies, driven by the trend to premiumisation. With Bourbon barrel inventories at their highest level for 40 years, the popularity of US whiskies shows no sign of waning in the home market. Heavily tied to premiumisation and the craft movement, production is increasingly driven by small-batch and single-barrel brands. Growing interest in the category and demand for more niche products will also fuel growth in the US single malt subcategory. Flavoured Bourbon and Tennessee whiskies remain the major drivers of growth within the category as they continue to challenge perceptions, attract new consumers and broaden consumption occasions. The rising status of US whiskey has ensured that premiumisation has been a major part of the category’s development in many regions, and will continue to be so. The two key US whiskey export markets: Germany and the UK – will continue to perform strongly; Japanese consumers are also expected to increasingly choose US whiskey. 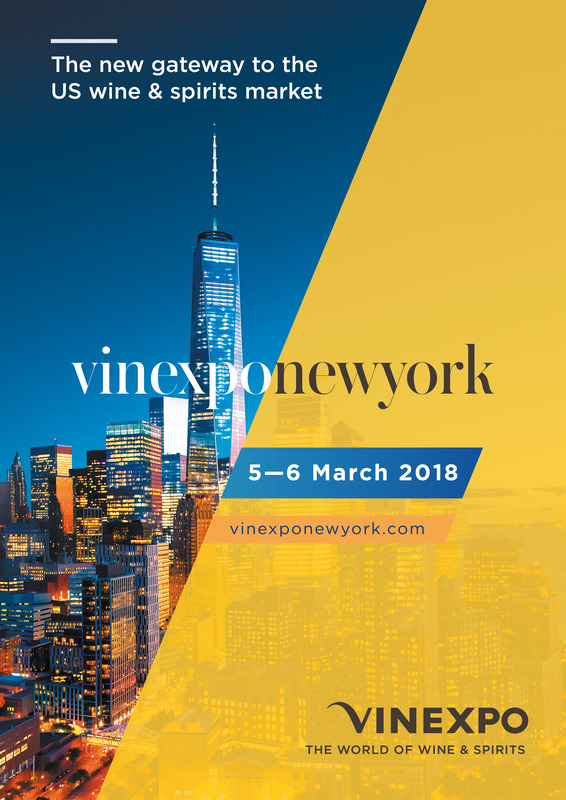 After its success in Asia with Vinexpo Hong Kong, now established over 20 years, its sister expo Vinexpo Tokyo and, most recently, the launch of Vinexpo New York scheduled in March 5 & 6 this year, Vinexpo Group has consolidated its ongoing expansion strategy. Vinexpo Group’s redefined strategy is wholly focused on creating solutions for clients and opportunities for growth, with the aim of strengthening the group’s position as the global market leader. Future growth is planned with the launch of Vinexpo Paris. The first Paris exhibition will take place 13-15 January 2020 at the Paris Convention Centre (Porte de Versailles). The advantages of holding an international wine and spirits exhibition in the French capital, in addition to the long-established expo held bianually in Bordeaux, are many – not least: its attractivity, its accessibility and its impartiality.